The draw to climb another one of the seven summits was just too much and I soon found myself on an aeroflot flight to Moscow. This was the first of two flights which took me across the vast country which is Russia. Arriving in Mineralnye Vody airport I was greeted by the rest of the group who included Virve (Finish girl), Orjan (Swedish), Franciso (Swedish) and Sergei (Russian guide). After a couple of hours of travelling through the Russian mountains in a mini-bus and swapping stories with the group we arrived at out hotel. The first thing we noticed was the drop in temperature as we got out of the mini-bus. We sat down to dinner that night and were given an introduction to the trip and our itinerary. We even managed to sneak in a few Russian beers which were rather tasty! We were told the adventure starts tomorrow, so we decided to hold back on too many beers and get a good night’s sleep. Early the next day, and after a great breakfast, we walked down the valley to the start of our acclimatisation hike up a mountain called Cheget. This was quite an experience, and I think I was more worried about the chairlifts falling to bits while 40 feet in the air than falling off a mountain or down a crevasse. But one thing we noticed straight away was that although there was clear weather above us, there were huge clouds in the distance. Anyway, after arriving (safely!) at the top of the lift, we headed up the steep slopes in an orderly line to the summit. It was from here that we got our first view of Elbrus, and it didn’t disappoint! It consisted of two huge snow domes just pointing towards the sky. This sight really got the nerves going and the group was buzzing. But we did notice those huge clouds from earlier were almost on top of us now so we needed to get down fairly quickly. So we retraced our steps back to the top of the chairlift, and as we arrived the snow started pouring from the sky. It was our first taste of colder weather, and during our decent on the chairlift we got a good coating of snow on one side. It was a relief to get back and have some hot food and a beer. But it also got us talking about the chances of a clear summit day. The next day the skies were clear again, but for how long? Today was the day we were heading up to ‘the Barrels’, which nowadays is a refuge for climbers. However in the seventies this had been a training camp for Russian athletes. A chairlift took us most of the way up to here too, and we were now up to snow level and a lot colder. We settled into our assigned barrels, and got our crampons and axes out for a bit of tuition on ice axe arrest. The walk helped us to keep the legs stretched and warm. We also passed a huge rock with memorials to climbers who have died on Elbrus, which really brought it home just how dangerous climbing in Russia can be. Most died from cold and exhaustion, so that night in the barrels tucking down to some top grub we had a good talk to our guide about safety and the history of the mountain which settled a few nerves and really got us all ready for the climb. Although heavy snow and hail outside was kind of killing the mood as a clear summit day seamed so far away. Still, we went to bed knowing we still had another day before the summit for the weather to improve. We had another early start the next day, and after another great breakfast we headed up the mountain to the Pastuckhov Rocks. This is basically a collection of black rocks and a well known local landmark. The trek leading up to these rocks was really hard going with the steep slopes and deep snow causing havoc on the rhythm of your walking pace. But this is what it was like leading up to the summit, and it got even steeper near the top so we needed to be ready. I also learnt a lesson that day about wet gloves. My fingers were so cold that when I did warm them back up the pain was agonising. I have never felt pain like it! My first job when I got back to the barrels was to warm and dry my gloves – no matter what. The rest of day was spent getting back to the barrels, talking about the summit with the guide and preparing for a 1.30am start the next day. So, after one really good final meal and some frantic bag packing we all went to bed for an early night. Eventually the sun started to come up and things became a little brighter, that included the spirits of the group. Although my legs were really pounding at this time for about 30 minutes until I had my second wind. But the snow was just as deep and the mountain just as steep all the way, which was just knackering. Finally, after what seamed like a day, we arrived at the saddle in-between the two huge domes of the mountain. We were so near, yet so far. We still had to climb the west dome – the highest at 5, 642 metres. A break at the saddle was very welcome and we even had an option of leaving a bit of unwanted gear here like extra water and food which some of us made the most of. Then the time came for the push towards the summit. My aching legs soon got back into the rhythm as we headed up the side of the dome, and for the first time we came across ice sheets where the crampons were really needed. This was really all about will power now, and we took it in turns to lead and really pushed each other up that dome. The final couple of hundred metres was a killer and we found ourselves doing 3 steps, rest, 3 steps, rest but we were getting there. To make things worse in the distance was another huge cloud coming over. Surely we weren’t going to get so far and miss the view? As we got to the top of the dome we spotted the flags marking the summit and it took all of the energy we had left to get to it. 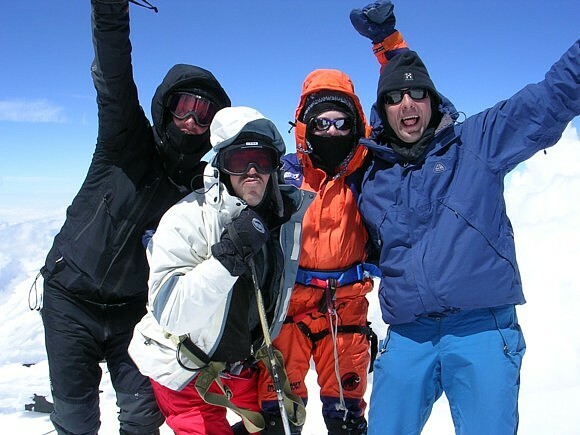 Collapsing on the summit on Elbrus, the feeling of achievement was overwhelming and Virve even had a few tears! We had been climbing for around 8 hours and we had really earned that summit. But as much as we were enjoying the summit that big cloud which was coming over meant we had to take a few pictures and head back to the barrel asap before we ended up on the memorial stone.